Wal Andrew became the 232nd umpire in VFL history when he took charge of the Essendon v. Richmond match at Windy Hill in round 13 1960. It was a debut long in the making. Andrew had begun umpiring with the VFL Second Eighteens some 12 seasons before, in 1948. He remained with the Second Eighteens until his promotion to the senior list in 1955. After 73 VCFL matches he was appointed to a single Reserve Grade match toward the end of 1958 and waited another 12 months before getting a second opportunity. Born in Melbourne on 12 March 1931 Wal was 29 years of age at his debut and from that point on the experience he had gained paid off. For the remainder of his career he was rarely out of the Reserve Grade or the VFL and if so it was one of the major VCFL competitions or finals. Seasons 1961 and 1963 were the most successful and included two night series semi-finals and grand finals in the Sunraysia, Western District and Hampden football leagues. Andrew retired at the end of the 1964 season having accumulated 39 VFL, 43 VFL Reserve Grade, 130 VCFL (5 grand finals) and 5 Tasmanian matches. Strangely, the VFLUA annual report, perhaps through a transcription error, recorded his first year as 1956 thereby incorrectly denying him 10-year life membership. Later discovery of both the original membership register and the Lindsay Lancaster papers as well as the 1955 list of match appointments confirmed this. However in the meantime Wal had taken advantage of the associate membership now offered and completed his 10 years membership some 40 years after his retirement. Walter Raymond Andrew passed away on 15 October 2016. Known universally by his middle name Michel Leo Noone was born in Carlton on 5 February 1926. During the Second World War he served in both the RAAF (1944-45) and the AIF (1945-47). Upon demobilisation he began umpiring with the YCW Football League in 1949 and was taken onto the VFL Second Eighteen List in 1950 where he umpired for three years until promotion to the VFL senior list in 1953. Leo was a VFLUA member from 1953 until his retirement in 1962. 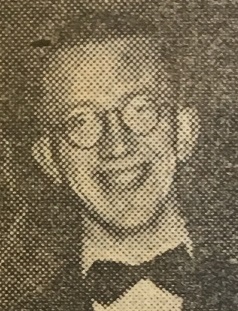 He became a life member in 1963. Over his 10 senior list seasons he umpired 189 VCFL matches including 18 finals. He umpired 2 Tasmanian finals and 4 Metropolitan League finals. His lone Grand Final was the 1962 Northern District Football League Reserves between Union and Border at Cohuna. It was also his final match with the whistle. Leo passed away on 21 May 2016 after a brief illness. Leo’s wife Margaret, recalled Leo’s love and passion for umpiring and of football, a passion that he shared with his grandchildren right up until his passing. 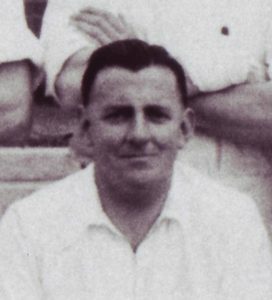 Frederick Tasman Kent ran the boundary in the VFL for six season between 1951-56. Born in Carlton on 28 July 1928 he grew up in Abbotsford and joined the VFL Second Eighteens in 1947 after a single year with the VFA in 1946. He was appointed to the VFL senior list in 1951 having umpired the 1950 VFL Second Eighteens Grand Final. His debut in round 2 1951 earned him Heritage Number 294 and over his career he umpired 83 VFL matches. Retiring from the boundary he took a break but the lure of the whistle was strong and Fred returned to the Second Eighteens as a field umpire from 1960-61. Later he was a VFA Tribunal Commissioner for a decade from 1970-79. Fred Kent passed away 7 October 2016. Well travelled as a youngster Val Hocking was an outstanding country footballer who retired and took up the whistle in the city, ultimately making his way to senior VFL football. Born Valentine Thomas Edwin Hocking in Cobram on 8 June 1928 Val, as he would generally be known, grew up in there and subsequently in Berrigan and Finley Before moving to Bentleigh, Caulfield, and Berwick. In all these locations he played football and he played it well. As a rover he played for Benalla (Ovens & Murray FL) and Berwick (Dandenong and District and later South Gippsland FL). He was a part of Berwick’s 1954 premiership side and represented the Dandenong and District FL in 1951 when they played the Murray FL. A talented all-round sportsman he also captained Berwick Cricket Club. Taking up umpiring with the South Gippland FL following his playing days he found he enjoyed it enough to apply to the VFL Second Eighteens and was accepted. Umpiring with them from 1957-58 he was promoted to the senior list in 1959. Immediatley successful he was appointed to his first country finals in 1960. At the start of 1961 he debuted in the Reserve Grade and by round 7 he was a senior VFL umpire earning Heritage Number 235 when he too charge of North Melbourne and St.Kilda at Arden Street. While North were somewhat disparaging, threatening lodging a complaint, the selectors were confident enough to appoint him in the following week. These were his only two senior appointments for the season but he finished strongly in the country with five finals including the OAM reserves grand final. The following year began well again and Val was back in the seniors for round 12 and finished the year with his final VFL total of eight matches. Val retired from umpiring at the end of the 1963 season. In addition to his VFL senior matches he umpired 18 Reserve Grade, 10 Tasmanian and 78 VCFL matches including a senior grand final in the Murray FL (although he never umpired Berwick or Benalla). Hocking returned to the South West Gippsland FL and for a number of years was the tribunal chairman. He passed away on 21 August 2016. Ralph Terrance O’Toole was born on 23 January 1933 probably in Tasmania from where he arrived in 1958. He had umpired with the North West Football Union from 1949-52 including the 1951 Fingal Association Grand Final, North Tasmanian Football Association 1953-55 and the Queenstown Football Association where he was also coach for two seasons. He had a short stint as secretary of the Longford Football Club resigning prior to the 1953 season the result of a personal conflict with the deputy chairman. After applying to join the VFL senior list in 1958 he was accepted and umpired for a single season compiling a 15-match career culminating in the Northern District FL reserves grand final. Ralph seems to have spent much of the rest of his life in Western Australia where he passed away on 31 March 2015. Kevin Murdoch Lindsay Lewer was born on 23 October 1935. He began umpiring in 1959 as a boundary unmpire with the VFL Second Eighteens. He transferred to the field in 1961 and in that capacity went to the senior list in 1964. Over the course of 1964-68 he umpired 80 VCFL matches. Kevin passed away peacefully surrounded by family on 19 October 2016. At only two VCFL matches John Harry Niere had one of the shortest VFL umpiring careers on record yet his umpiring experience was not limited to just those games. Born in Ormond on 23 October 1931 he grew up in the area and played football with Ormond U19 including the 1950 VAFA U19 premiership in 1950. Beginning his umpiring career with the VFL Second Eighteens as a boundary umpire in 1952 he moved to north-western Victoria the following year and continued his umpiring with the Sunraysia FL 1953-54 as a field umpire. While in Mildura he was on the list with other future VFL umpires Ron Stait (1958-68) and Corbett Shipp (1958). A return to Melbourne was a return to the Second Eighteens for 1955-56. In at least 1956 he was elected treasurer of the Second Eighteens Umpires’ Association. Promotion to the senior list came in 1957 following an emergency appointment in the 1956 Second Eighteens Second-Semi Final but after only two matches – at Poowong and Nanadaly – work interevened and meant retirement. John Niere passed away on 22 June 2016. One of a pair of umpiring brothers Wal Lane passed away peacefully at Carnsworth, Kew on 9 June 2016 aged 79. In a senior career spanning seasons 1960-62 he officiated in 38 VCFL and 3 Metropolitan FL matches yet his contribution to umpiring extended beyond these fixtures. Walter James Lane was born in Melbourne on 24 September 1936 and grew up in Reservoir. He played football with Reservoir-Lakeside in the Diamond Valley the member of a losing grand final team in 1953. His younger brother, Ben, later played for the same team and also took on umpiring, ultimately becoming a VFLUA life member. After retiring from playing Wal took up boundary umping with the VFL Second Eighteens in 1955. He transferred to the field in 1957. In that same year he was elected social secretary of the VFL Second Eighteen Umpires’ Association, a demanding role he continued in 1958. Promotion to the senior list came in 1960. Following his VFL career Wal later umpired with Preston and District JFL and later, after a move to South Australia took on veterans lifesaving where he was a member of 1976 State Champion Club, Brighton. Wal Lane contributed to umpiring both on and off the field and loved his time in the game. Vale Walter. Unlike most of the members of the VFL/AFL Umpires’ Association Bob Barkley did not play football before taking up the whistle and umpiring for a decade with the VFL. Robert John Barkley was born in Glen Huntly on 26 June 1932 and grew up in the area. He was mainly involved in cycling with Brighton-South Caulfield Professional Bicycle Club where he was junior road and track champion and senior track champion. 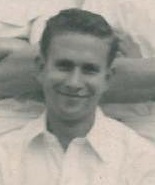 Bob began umpiring when he joined the VFL Second Eighteens in 1956. He was promoted to the senior list in 1961. In the following ten seasons he followed the well-known paths around the Victorian country leagues. The finals he umpired give a good geographical indication of the VFL umpiring life of the time. His first VCFL final was the 1965 Northern District Second Semi-final at Barham and in the remainder of his career he umpired finals in Buraja, Sea Lake , Welshpool and Cudgewa. When he left the VFL senior list after 1970 he had umpired 162 VCFL and 3 metropolitan matches and was awarded VFLUA life membership at the following year’s annual meeting. Returning to the Reserve Grade he umpired for a further two seasons before retiring. Bob Barkley passed away on 22 September 2015. Born in Preston on 14 April 1920 Gordon George Barron umpired for parts of three seasons with the VFL. He was possibly promoted from the Second Eighteens in July 1947 which goes some way to explainng his appointment to the Hampden league reserves grand final after only two games on the senior list He finished that year with the Upper Goulburn senior preliminary final. Only 2 matches early on in 1948 were followed by his only full season in 1949. Barron left the VFL at the end of 1949 having umpired 21 VCFL matches. He passed away 1 September 2015, aged 95. 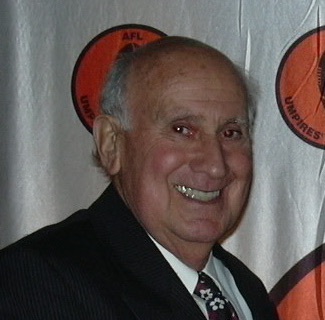 Merv Blundy umpired with the VFL from 1957-1961. While he was not appointed to a final during his time on the list there was no doubt about his running ability. Mervyn Alfred Blundy was born in Birregurra on 17 October 1926 and grew up in Forrest where he played football for the local club. A move to Albury saw him play for North Albury in the Hume league. It was here that he began umpiring in 1954. Moving to Melbourne in 1956 he joined the VFL Second Eighteens and a year later was promoted to the VFL senior list. On two occasions he umpired Forrest, both times away from home, once at Birregurra – a real homecoming. He also umpired North Albury three times, again all away games. In five seasons Merv umpired 74 VCFL matches. Prior to his umpiring days Merv had been an professional runner competing in various sprint races and winning the Nariel Gift. After leaving umpiring he devoted much time to athletics serving both Box Hill Athletic Club and the Victorian Amateur Athletic Association. In 2000, Merv was honoured with an Athletics Victoria Merit Award for his many years of service to both organisations. At Box Hill his service on the committee, including stints as president and vice-president, earned him life membership. Merv Blundy passed away on 27 January 2015. Kevin John Cass was born in Melbourne on 12 August 1936. As a yougster he played golf, cricket and tennis before deciding to take up umpring in 1956. He field umpired with the VFL Second Eighteens for three seasons before being promoted to the VFL senior list in 1959. After a year off in 1961 he umpired his final two seasons in 1962-63. He departed the senior list having umpired 45 VCFL matches. From 1964-66 he coached the Oak Park FC under-13s and under 15s. Kevin returned to the VFL Reserve GRade in 1996 as a goal umpire completing three seasons before finally retiring from umpring at the end of 1968. Kevin Cass passed away 12 May 2015. Peter Marsh gave much of his life to football and particularly to umpiring and umpires. His connections with numerous football organisations are testament to his passion for the game and its officials. Peter Edward Marsh was born on 5 May 1944 in East Camberwell and grew up in Burwood where he played football with the local Burwood Football Club. Always of a sporting nature he also enjoyed tennis, squash, netball and basketball as well coaching athletics. In 1971 Peter began umpiring with the VFL Reserve Grade and after two years was promoted to the VFL senior list for the 1973 season. Over the next two seasons he umpired 35 VCFL matches before the commitments of running a business left no time for country appointments and forced his retirement. ‘Marshie’ was not lost to umpiring and in fact his involvement continued for another three decades. As field umpire with the Doncaster Football League (4 years), East Suburban Churches Football Association (12), Yarra Valley Football League (1), and the Italian Football League (2) he combined the on-field role with off-field contributions in coaching roles. He was umpires advisor at ESCFA for a decade, at Doncaster for two years and served on the Southern Football League Tribunal for four years. From 1998-2014 Peter was a field umpires observer with the Victorian Football League. In this latter role he provided match day feedback to many umpires who went on to both VFL and AFL senior careers. Always encouraging towards the umpires he coached and observed he will be fondly remembered by all who crossed his path. Peter passed away on 13 July 2016.